In 2011, with all the technology available to you, you’ll never have to make a mistake again! Smartphones have become part of everyday life for most French people. These phones are so well integrated into daily life that many insurers see this technology as an unparalleled opportunity for staying in touch with their clients. Nevertheless, although the mobile phone is very easy to use for communication or marketing operations, developing an insurance offer via mobile platform is significantly more complex: How can you effectively guarantee that the data captured by the phone reflects the actual risks the driver takes, knowing that mobile phones are not “welded” to the chassis of the vehicle and that a driver could deactivate any mobile application at his convenience? This unique trio, vehicle/smartphone/authentication module, renders the user free to activate or deactivate the pricing function at his convenience. The insurer, meanwhile, can index the premium depending on the “rate of use” of the service. From a technological point of view, the authentication module is designed as a secure bluetooth accessory that can be easily installed on the vehicle in a few seconds. This module can be installed by the insurer or by the driver him/herself. The latter remains the preferred solution for “bank insurers” who cannot deploy agents on the ground directly. The bank insurers contend that, once they subscribe to an insurance contract, the insureds are responsible for positioning the authentication module on the correct vehicle. But insureds have to keep in mind that, at any given moment, the insurer could check the module to verify that it was correctly installed on the subscription date, and not just after a disaster, for example. Without the authentication module, the software could be used in “demo” mode to allow drivers to evaluate an insurance offer on their smartphone before they subscribe. What’s more, this demonstration mode allows drivers to test out various offers and verify the actual savings expected, depending on the improvements they are ready to make to their driving style. But above and beyond all these advantages, this new product is a way for insurers to test a usage-based insurance offer without having to equip the vehicle right away. 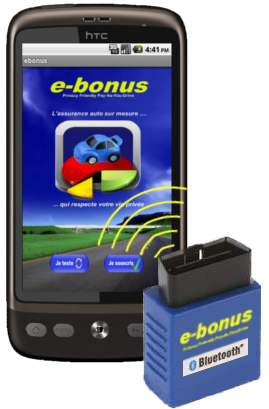 And for drivers, Smartphone ebonus offers a way to remain free and responsible for their conduct on the road.